a Pickmaster lock kit containing lock-picking equipment, a lock pick gun, toe nail clippers, a Swiss army knife, a black ninja hood, a pair of black leather gloves, and other items. MARK C. THOMAS, Plaintiff/Appellee, v. DALE HUNGERFORD, Individually and in his official capacity as police officer for the city of Kearney, Nebraska; MICHAEL KIRKWOOD, Individually and in his official capacity as police officer for the city of Kearney, Nebraska, Defendants, JEFF GRISS, Individually and in his official capacity as police officer for the city of Kearney, Nebraska, Defendant/Appellant. Thomas’s amended complaint as stating a cause of action against Griss on two grounds: that Griss had conducted an inventory search of Thomas’s duffel bag that was not in accordance with established procedures, and that Griss had planted the black ninja hood and the “o” ring in the duffel bag. The district court denied Griss’s motion for summary judgment, and this appeal followed. Although the denial of a summary judgment motion is not a final judgment, a district court’s denial of a qualified immunity claim is an immediately appealable “final decision” within the meaning of 28 U.S.C. § 1291. The order denying Griss’s summary judgment motion is reversed, and the case is remanded to the district court for entry of judgment dismissing the complaint. The district court also denied Griss’s motion for summary judgment on Thomas’s claim that Griss planted a black ninja hood and an “o” ring in Thomas’s duffel bag. The magistrate judge construed Thomas’s complaint to allege that because the hood and “o” ring did not appear on Ward’s inventory form, Griss must have planted the items. Griss argues that he is absolutely immune from this claim because the allegation that he planted evidence is simply an assertion that he committed perjury when he testified at Thomas’s trial about the events surrounding Thomas’s arrest. Thomas concedes that Griss would be entitled to absolute immunity on such a claim, for officers are absolutely immune from liability under 42 U.S.C. § 1983 for damages arising out of their alleged perjurious testimony at trial. Briscoe v. LaHue, 460 U.S. 325, 342, 75 L. Ed. 2d 96, 103 S. Ct. 1108 (1983). Thomas argues, however, that Griss did more than perjure himself, contending that Griss planted some of the evidence that the prosecutor used against him. Although absolute immunity may not shield Griss against such a claim, the district court should nevertheless have granted Griss’s summary judgment motion. The inventory search was also found acceptable and not a violation of the Fourth Amendment, at least in part because the defendant himself asked to have the contents of the bag inventoried. I think an “o” ring is a metal piece from a lock (in this case “a Kawneer-brand lock”) that can be used for breaking glass like car windows (see similarly Ninja rocks which will be mentioned in future case). 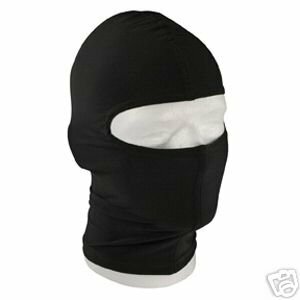 But what makes a “black ninja hood” different from a mere black hood or black hood mask, this is not entirely clear to me, other than to further implicate that the defendant’s possessions are burglary tools. As if the tools themselves have intent, and this hood intended to be ninja.